Dr. King is double Board Certified in Otolaryngology and Facial Plastic Surgery with an M.D. from the LSU School of Medicine in New Orleans, LA, and a Bachelors in French from Tulane University in New Orleans, LA. Dr. King completed her fellowship in Facial Plastic and Reconstructive Surgery at Glasgold Group Plastic Surgery in Highland Park, NJ and an internship in General Surgery at Mayo Clinic in Rochester, MN. Her residency was completed in Otolaryngology at University of Iowa in Iowa City, IA. Dr. King served as the President of the Aesculapius Society in 2003 and is a recipient of the American Medical Women’s Association Glasgow-Rubin Achievement Citation, which honors women who are in the top 10% of their class. 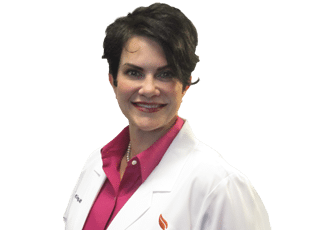 She was elected to the AOA National Medical Honor Society in 2003 and is also a recipient of the Scholarship for academic and leadership merit at LSU School of Medicine in 2003. Dr. King believes that her focus on understanding and educating her patients gives them the tools to better tolerate whatever they are going through, whether illness or elective surgery. She works hard to fully explain the issues at hand for this reason. “I believe that taking the time to do a proper and thorough job leads to better outcomes and happier patients.” She feels strongly that every patient deserves to be heard and finds that facial plastic surgery is a perfect outlet for her perfectionist and artistic personality. Dr. King is a singer, a cellist and an artist who enjoys interior design, but her favorite past-time is simply spending time with her family and watching her daughter blossom. Dr. King makes charitable donations to Shriners International and Shriners Hospital for Children to help support their efforts to provide orthopedic, burn, spinal cord injury and cleft lip and palate care to children under 18.